Quit medicating your kids. Problem: Design a fashion accessory highlighting a sociopolitical issue that you're passionate about. 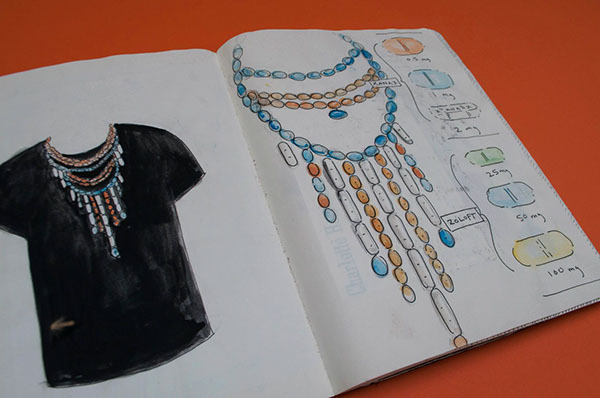 Solution: A necklace comprised of various pills. According to the Center for Disease Control, as of 2007 approx. 9.5% (5.4 American children) age 4-17 have been diagnosed with ADHD and of those children 2.7 million are being medicated in order to treat the disorder. The American Academy of Pediatrics has approved treating this condition with stimulants on children as young as age 4. According to the National Center for Heath Statistic, about 5% of children ages 12-19 in the US are taking antidepressants. Antidepressant use increased by almost 400% between 2005 and 2008. Created for Kevin O'Callaghan's 3D Design course.